Her bad breath was so bad that she finally went to the doctor. All he had to do was look behind her tonsils. There could be something hiding in your mouth that you don't know much about, but it can trigger bad breath and can even be painful when you swallow. Unfortunately, this harmless phenomenon is not well known. Careful! The following pictures aren't for the squeamish. People who often suffer from tonsillitis often develop fissures in their tonsils. 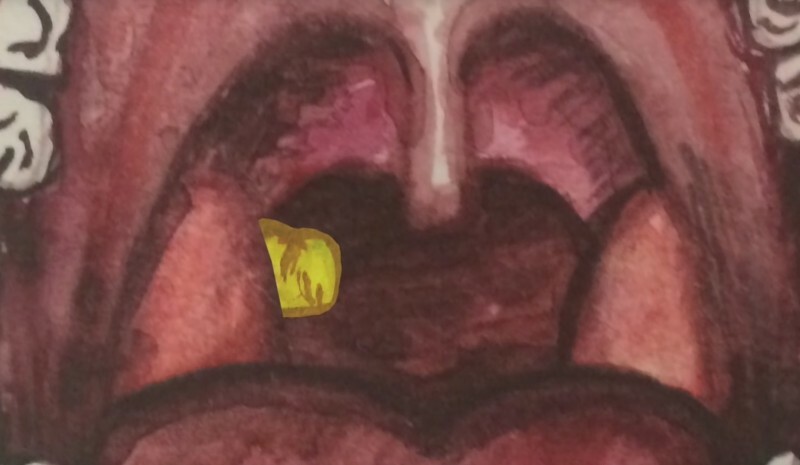 These "holes" in the tonsils are called "crypts." Food, dead cells, and bacteria can infest these "tonsil crypts." Extra calcium deposits solidify the material into so-called tonsil stones which stick stubbornly to your sensitive tonsils. According to a study, 1 in 4 patients suffer from tonsil stones. These "stones" can cause pain, ear infections, and particuarly bad breath. That's why they should be removed. But how? There are two possibilities: tonsil stones that are close to the surface are often easily spotable on your tonsils. They look like white spots. If you press carefully with the bottom of a toothbrush or a cotton swab then they often fall out on their own. They can sometimes be "washed out" with a dental water jet. No need to panic if you accidentally swallow them. If you suspect you have tonsil stones, and you don't trust yourself to "push them out," or it's painful, then it's worth visiting a nose / ear specialist or the dentist. This can remove the stones easily and effectively and give you advice on how to prevent them next time. Therefore: always remember tonsil stones if you have a bad breath or inflamed or aching tonsils. Sometimes they can lurk for years and are just waiting to be finally removed! Share this important information with all you know. Because who wants to keep these nasty pieces of work in their mouth?